Solo shows have become group affairs! Artistic collaboration is no new thing, but why is it such a hot thing in the Australian art scene right now to accelerate your profile by forming an artist duo or group? 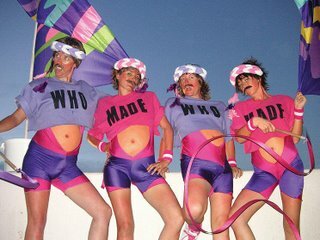 It seems you get instant attention if you actually bear more resemblance to some kind of parallel universe Australian Idol act bearing a really ironic name and doing the circus clown routine absolutely everywhere including the gallery space. The Kingpins, soda_jerk, Ms & Mr, Gossip Pop, the Motel Sisters, Wild Boys, and probably others I've forgotten about, all comprise the phenomenal proliferation of artist groups in the contemporary Australian art scene. And while she is a solo act, Danielle Freakley's project Artist Running Space (where she pretends to be a human gallery by exhibiting other artists' work on her white-cube-for-a-head) may as well be a group act because there's always her performance adorned by someone else's images. Actually that's given me an idea: maybe artist Simon Barney should become his mobile Briefcase space, and to view the art he would open up like that McDonalds advert where children hatch out of their parents Babooshka Doll style in search of the perfect Meal Deal. I'll admit, these bright young group things make great work for the most part and shake up the often staid state of the arts. But my cynical side often wonders if art today needs this kind of glossy hook in order to make an impact, or at the very least, get some crowd-pleasing attention. I'm all for the dismantling of the high/low binary which once claimed art as elite and pop culture as its inbred cousin. Art today is another form of pop culture, even if it is unremarkable for a mostly disinterested mass audience. Certainly, the engineering of the art star is testament to such celebrity-invested phenomena that sees art as 'the new entertainment.' What bothers me is that while this trend of the artist group has produced some interesting and/or entertaining artwork I fear that critical art culture has suffered a bit of a dumbing down. Just because a catalogue essay might herald the work in Baudrillardian or McLuhanesque terms doesn't mean the work's gonna be that hot next year. And while postmodern culture is specifically manufactured around its very impermanence, I don't really think the current crop of performative art groups popping up have thought too hard about when, where or how their deaths will be staged. Rather, their deaths may happen the hard way: through failed comebacks, where their work may one day forlornly line the bargain bins of the commercial galleries that once clamoured to represent them. 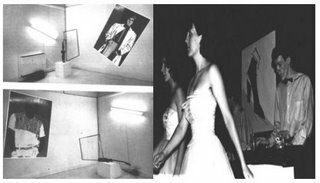 → ↑ → perform at George Patton Gallery, Melbourne, 1980. For all the fun to be had by this new wave of art/pop or pop/art stars, we must never forget that → ↑ → (pronounced 'tsk tsk tsk') was probably the best art pop group to have emerged in Australia. → ↑ → paved the way for the kinds of experimental, performative and ‘hybrid’ multimedia works featured ad nauseum in galleries and museums today. Thankfully the Kingpins know to honour their 'artcestors.' In the recent issue of Photofile (77, Autumn 2006) the Kingpins interview Philip Brophy, the Melbourne artist who formed → ↑ → in the late 1970s and who has since carved out an impressive body of work as a solo artist making film, video, sound, design and scholarly commentary. The article is illustrated with a glossy production still where Brophy and the Kingpins pose pirate-style in a pop combo called 30 BMP. Inspired inter-generational post-pop art perhaps? Whatever it is, we shouldn't forget that Brophy, in an earlier issue of Photofile (74 Winter 2005) claimed: "An artist using a pop song in video art is like anyone either enrolling in a DJ course or wearing an iPod in public: TRAGIC." Funny that, because without pop songs some of the Kingpins' videos just wouldn't work. And as for Brophy's Evaporated Music – well it is entirely based on deconstructing the sonic elements of a few TRAGIC pop music videos! If we took the pop songs out of a lot of recent art all that would remain is some weird kind of out-take or blooper reel found in the Special Features section of a DVD that doesn't exist but is called Untitled (Very Cindy Sherman). working on my own is boring and I never get anything done. I like this blog, you should update it more but then, how much art happens in Sydney?